AlphaSense has many benefits as a standout platform for equity research. In this post, I would like to showcase these benefits in action and present my process of using the platform when researching a specific stock. I focus on meaningful U.S. companies in the over-the-counter (OTC) space. 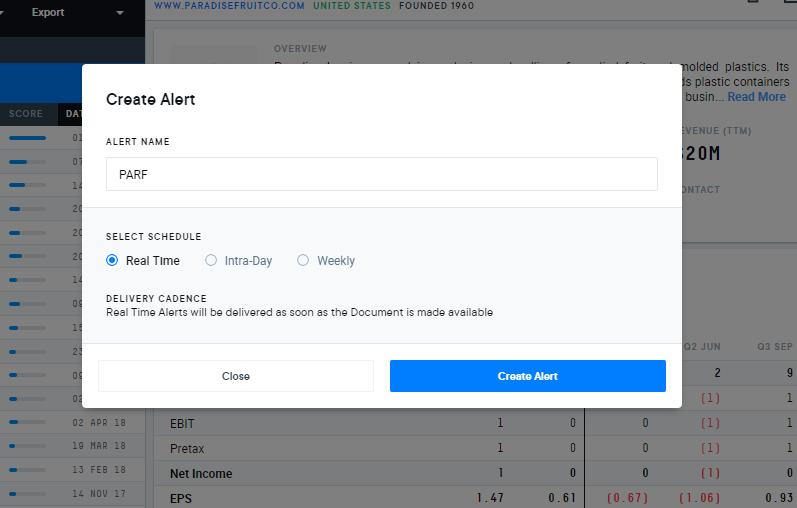 For this example, I decided to select Paradise, Inc. (PARF), one of the stocks I’ve been following and one I believe is quite interesting from a research perspective. Interesting. Let’s look into this. Once I identify a company to research, I use AlphaSense and set up email alerts before doing anything else. These email alerts allow me to stay on top of what is happening during my research period, and keep me informed of any changes or material news. The best thing about the alerts? They allow you to efficiently stay on top of everything you need to know across a global investment universe. I then search for the company’s name. If you’re looking to really zoom in, use quotes around a company name or keywords to generate more precise results. I then proceed to scrutinize the latest quarterly and annual reports, where I can quickly learn what I need to know and develop a list of key questions I want answered. By using AlphaSense, I can perform this step easily with AlphaSense’s Blackline feature. This allows me to compare the 10K or 10Q with the previous reports for any meaningful changes. After I’ve set alerts and completed some initial fact gathering and questions, I’m ready to begin a series of searches. Armed with my key questions, I use AlphaSense to quickly find answers through basic keyword search across a vast library of content. I read that one recent issue PARF faces is the performance of their molded plastics subsidiary. In their 10K for FY2017, they noted that one customer decided to switch suppliers, and PARF lost a connected revenue stream. I then proceed to search for other mentions of the subsidiary in order to understand whether this is a trend and something that has happened before. I can sort the results by relevance score, which helps me prioritize filings where the company mentioned the keyword more frequently. As you can see below, the subsidiary had great performance until last year. They saw decreases in revenue, but otherwise, the subsidiary was relatively stable. Perhaps the recent challenge I found was a one-off event. Further review shows that PARF mentions they were able to grow the revenue stream in the last quarter. Another interesting aspect of the company is revenue strength. It is imperative to understand whether the management believes the candied fruit market they dominate changed in any way. Thus, I searched for any mentions of revenue changes. AlphaSense Synonym Recognition technology automatically surfaces all related keywords to “sales” or “revenue,” allowing me to capture all variances in conversation, without fear of missing important insights. Amazingly, the company has showcased strong stability in the business. Despite what might seem like an obscure product, PARF has generated similar profits and revenue over the past 13 years, including throughout the financial crisis. These two examples are relatively broad. You can easily pin down results via optimizing your search parameters, including source documents, time frame, etc., in your AlphaSense search. Once I can answer most of the questions about the stock, I expand my search outside SEC filings. I start to search for mentions of “Paradise, Inc.” by other companies. AlphaSense is uniquely positioned to perform this task efficiently. Just input the name of the company into the search box and input “-PARF” in the ticker box to exclude what the company has published about itself from the results. For this search, I also searched the ownership forms, because I wanted to see whether there are any firms that invest in PARF. I also performed the same search for the management of the company in order to track whether the management is involved with any other company and details of any past dealings. In the case of PARF, the insiders are relatively inactive outside of the company. Most of them are connected to a family that owns a large stake in the company and have no other public business dealings. After checking what others have to say about the company, I move onto research about the candied fruit industry. This allows to me swiftly identify potential competitors or news likely to impact the company. This is relevant to PARF because the company recently announced they are seeking “strategic alternatives,” which could mean they’re looking to sell their firm. In that case, SENEA may be interested in PARF, which certainly impacts my investment thesis. Now that I have answered the key questions, checked PARF’s competition and understand industry dynamics, I can focus on building a proper investment thesis. Before I do so, I usually save additional email alerts I believe are going to be useful to track in the future. I set up alerts for a broad search for “candied fruit.” I also set up alerts for keywords, “molded plastics,” and restrict this to PARF’s filings. Once a new filing is available with my keywords, I immediately receive an email highlighting the relevant section of the filing. I can see at a glance whether this is something material for the stock or not. I believe by sharing my usual research process above, you can see how AlphaSense pushes equity research to a new level. It allows an analyst to quickly and efficiently understand any situation and ensure they don’t miss anything material that might impact their view. Most importantly, the work is no longer reliant on using many different research channels with varying quality in terms of data and efficiency.